It’s always a cause for celebration when Green People bring out a new product, so imagine my excitement to be trying out not one but three of them? This is a wondrous product indeed. It’s designed to give your skin a real boost by stimulating collagen, evening out redness and increasing hydration. It contains Wakame which increases oxygen consumption, reduces damage caused by free radicals and stimulates the formation of new collagen. Everlasting Flower is rich in anti-oxidants and Green Marine Macro Algae increases hydration and reduces water loss resulting in a plumping effect on the skin. It’s also full of lovely herbs that smell divine and boost radiance. It’s so potent you only need to use twice a week or if your skin feels dull or dry but I won’t tell if you decide to use it every day (which I’ve been doing). I’ve been using it mixed with some of my sunblock during the lovely sunny weather we’ve been having. I suspect it would make a great night cream too. This is part of the Sensitive Scent Free range ( i.e. tailor made for those prone to eczema, psoriasis, rosacea and to skin allergies ). I don’t have any of these complaints but have always loved this range anyway and often use them. Green People always say that ALL their products are organic and pure and are unlikely to cause problems even for those prone to skin irritations, but this range is even more gentle and completely scent free. Now I love a serum. They are light, absorb wonderfully and are highly effective. My favourite daily regime is to take a serum, add some Vitamin C powder and if my skin’s feeling a bit dehydrated, a few drops of skin oil. The result is light and nourishing. This serum is now a firm favourite. 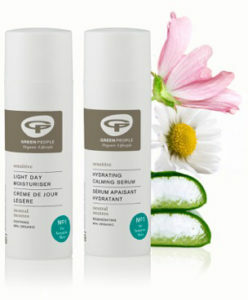 Light and non sticky, it’s firming and very hydrating and once again stimulates collagen production. This is from the same range and is designed to be used with the serum. If you do have sensitive skin you won’t want to add Vitamin C powder and oil to your serum like me. You will be much better off nourishing your skin with this ultra light moisturiser. Can be used on it’s own or after applying the serum. With many of the products that I use and indeed love, one of the down sides is that I often end up feeling a bit sticky and that I have a lot of product on my face and that’s before I even start with the make up. 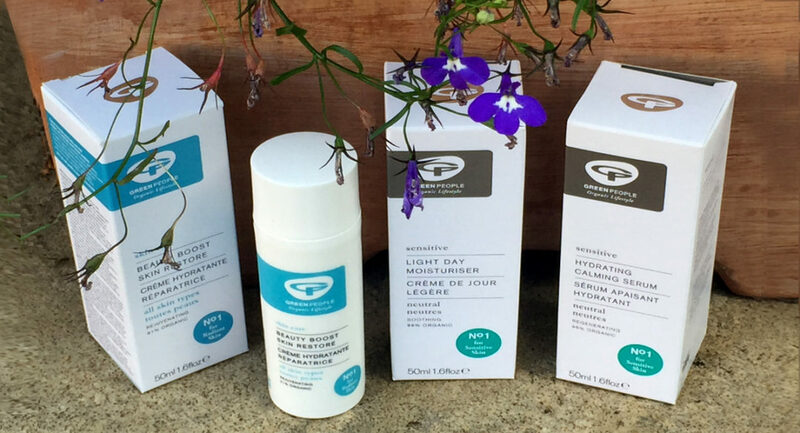 These products are wonderfully light and I really can’t recommend them enough, whether you have skin allergies or not. They are pure, organic and very nourishing. Just fabulous. More and more people seem to have sensitive skin. This is a fantastic range to try if you’re one of them. 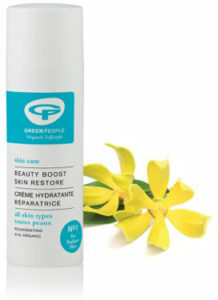 There’s a good chance you will also be able to use most of the other products in the Green People range as well. Special Offer – Green People have a special offer code until the 16th September. The code is SEP15. This will get customers 15% off their order (excluding gift packs and bundles). I usually use Extreme protect on it’s own because it has so many skin enhancing qualities. With the Beauty Boost I was using a regular sun block (chemical free). Have bought the Beauty Boost.loving it think I might use it most days.Any chance you might check out Mascara’s and eye makeup?